If it is – give yourself a hand. If it isn’t, or if you don’t know what I’m talking about, read on… I’m going to give you in a few simple steps explaining how to get naked – and why you MUST, if you want to give it a chance of success with agents and editors. Before you send out that manuscript, hold on a second… take a minute to make sure it’s naked. By which I mean absolutely clean and clutter-free, ready for an agent or editor to take one look and say… YES! Who wouldn’t want that? Yet many writers I’ve known spoil their manuscript by adding things, covering up its nakedness. Trust the agent; trust the editor. They’ve handled more books than you’ll ever write, and they’ll be able to see your story’s potential even without the fancy touches. Are you killing your chances before anyone even starts reading your book? I hinted in my post last week that you can’t really go wrong when you’re choosing book titles. Except you can. It’s not easy, but it is definitely possible to choose a lousy title for your kids’ book. It’s all about cracking the “cover” of your book, real or virtual. Whether you’re self-publishing or sending your book around to agents or publishers, you need a title that’ll get readers onto page one, where hopefully, your story will do the work of hooking them in for good. True, publishers may change the “working title” of a book once they decide to publish it, but you’re still going to need a name for your book that hooks them into reading the thing in the first place. So try to avoid these FIVE big mistakes. Hi, there. What’s your name??? It’s the first question we ask most people, and when we’re looking for a book, we ask it (in our minds), before we even crack open the cover. But what if you can’t think of a good name? What is a good name, anyway? Your book’s title doesn't have to be awesome… or even poetic. Duckies, dragons, dinos: how old is your reader? Can you tell the difference between a three-year-old and a ten-year-old? I’m guessing you answered yes to that question. But do you ask yourself this question when you sit down to write a picture book? When you’re writing the thing, of course, it’s most important to follow your inspiration and get the words down on the page (screen!). But once you’re ready to think about submitting it or publishing it yourself, it’s a different story. THEN you have to start thinking about audience. 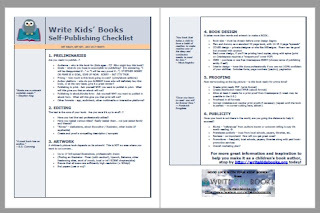 Get your FREE self-publishing checklist! It’s easier than you ever imagined! In only 2 concise pages, this PDF offers you everything you need to get started OR get inspired. 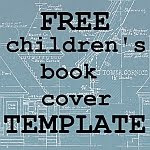 Turn your fabulous story into an even more fabulous ready-to-print-and-Kindle children's book. This checklist distills my own experience - about five years' worth - into one quick and easy reference. To get the checklist INSTANTLY, please fill out the form to be added to our mailing list. What’s the best children’s book? Do you have a favourite children’s book? Sure, you do. One you love opening up, time and again, and it makes you smile every single time. But is it the best children’s book? What IS the best children’s book, anyway? Asking this is very much like asking, "What is the best food?" The answer, of course, is pizza. Seriously, though, most of us recognize that there is no answer to this question. It really depends on so much. Like what your tastes are, along with your nutritional needs and your mood.